(January 25, 2015) The City of Charlotte has developed a Community Investment Plan (CIP), which is a long-range investment program designed to meet the needs of our growing community. The CIP includes the Comprehensive Neighborhood Improvement Program (CNIP), which fosters vibrant, diverse, and economically strong communities with a highly connected network of streets around activity nodes that include a mix of office, retail, and residential land uses. The city selected five target areas for CNIP, including an area centered on Whitehall and Ayrsley. Over the next several years, the city will plan, design, and implement $120 million in proposed community improvements in these areas, including $30 million in the Whitehall-Ayrsley target area. The Whitehall-Ayrsley CNIP area actually includes Berewick and other areas of Steele Creek bounded on the south by Westinghouse Boulevard, on the east by Sugar Creek, and on the north by the Charlotte corporate limits. The Whitehall-Ayrsley target area lacks a well connected street and pedestrian network, greenways, and bike lanes. CNIP will look for opportunities to enhance ammenities in the area to connect activity nodes and neighborhoods. CNIP will be funded through Neighborhood Improvement Bonds. City voters approved a $20 million bond in November 2014, which will provide financing for planning and other early activities. The city plans additional neighborhood improvement bonds of $40 million each in 2016 and 2018 and $20 million in 2020. City staff met with representatives of the Residents Association's Land Use Committee in October. Committee members suggested that the area around Olympic High School, Kennedy Middle School, and Steele Creek Elementary School be included as one of the focus areas to be studied for sidewalks and other improvements. 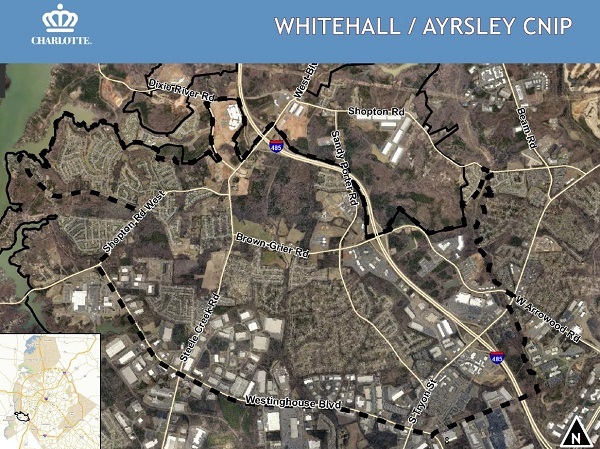 To see maps and other information about the Whitehall-Ayrsley CNIP area, see the Whitehall-Ayrsley CNIP Overview Presentation. City staff will present information about CNIP and answer questions at the Steele Creek Residents Association meeting on March 12.